Toothpaste to whiten teeth. Toothpaste for sensitive teeth. All natural toothpaste. Shelves are stocked with every kind of toothpaste imaginable and then some, each one claiming to solve a different oral problem you may not have even known you had. With so many options available, it’s easy to get overwhelmed, so we’ve created a simple guide to help break it down for you. Most commercial toothpastes contain a variety of chemicals found in nature, such as triclosan and artificial preservatives. While these may pose no threat in small amounts, many of them have not been studied extensively, nor have their combined effects on the human body been tested. 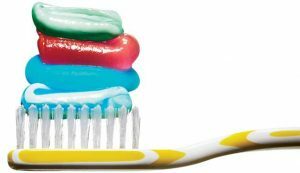 For those who would rather play it safe, a natural toothpaste may be their best choice, but you should still be sure to read the list of ingredients. There is no legal requirement for use of the “all natural” label, which means even products bearing that label may contain questionable ingredients. As soon as you see teeth breaking through the gum line, it’s time to start brushing them, even when they’re only baby teeth. It’s never too early to get your children in the habit of maintaining their oral health, and most children’s toothpaste available on the market today are designed for children aged two and up. Getting them a toothpaste they like (for example, if it has their favorite animated character on the packaging) will increase the likelihood they’ll use it without putting up a fight. Fluoride toothpaste is highly recommended for everyone, even children. Fluoride is a naturally-occurring mineral that helps to protect the enamel of our teeth from decay and can even reverse the early stages of enamel deterioration. A few years ago, the American Dental Association changed its recommendation to include all children, using only a smear on the toothbrush until the child becomes a perfect spitter. As spitting out the toothpaste is perfected, the child should then use a pea size amount each and every time the teeth are brushed. By helping strengthen the enamel on our teeth, fluoride can also help reduce tooth sensitivity to hot and cold, but it’s not always enough. For those who need more help in dealing with their sensitive teeth, there are toothpastes on the market designed to help with that problem, while simultaneously keeping teeth clean and healthy. Without regular, efficient brushing, plaque can build up on the surfaces of our teeth and eventually harden into tartar, which is much more difficult to remove. Tartar control toothpastes are specifically designed to prevent this by breaking down the plaque before it has a chance to become tartar. But note that these toothpastes are designed to prevent tartar from developing and can do little once the plaque has already solidified, so it’s more of a preventive measure. For those who want that camera-ready smile, but can’t afford to hire a professional, whitening toothpastes are an option. Some of them use abrasive ingredients to scrub away stains on the surface of teeth while others use peroxide as a whitener, so check the ingredients list and make sure you’re comfortable with the product you’re using. Regardless of which way you end up leaning, just make sure your choice bears the American Dental Association (ADA) stamp, usually next to the company’s logo. The ADA stamp lets you know that the product meets their standards for safety and efficacy. If you have concerns about toothpaste or cavity prevention, you need to consult with your dentist as soon as you can. At Simply Smiles Dentistry, we can provide you with the proper guidance and treatment you need to keep your teeth cavity free. CONTACT OUR OFFICE today or schedule your appointment online.